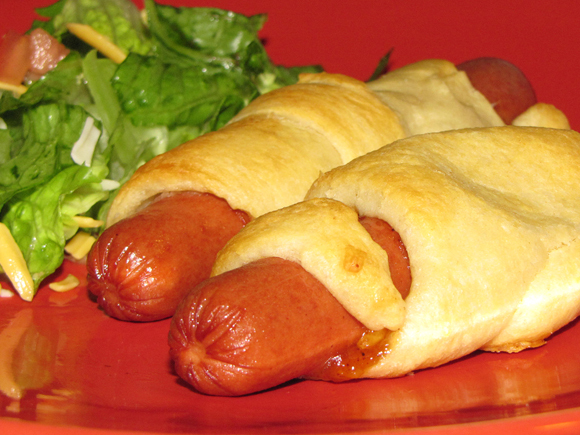 I put my own little twist on the pigs in a blanket appetizer by spreading some BBQ on the crescent roll and sprinkling a little shredded cheddar on it before adding the mini dogs. These additions add a little variation and tangy flavor that makes them really good. These crescent dogs can pretty much have anything added to them to make them your own and suit your own tastes. You could place a slice of American cheese on them before baking, bake them plain and dip them in mustard or ketchup, or even sprinkle on some cooked bacon before you roll them! How will you make yours? 2. Spread BBQ sauce evenly over open crescent rolls and top with shredded cheese. 3. Wrap one crescent roll around one hot dog starting with the large triangle end flush with the hot dog and finishing with the small point. 4. Lightly spray foil-lined baking sheet with non-stick spray and place rolls evenly spaced apart.